441 people in our community are currently praying with you. This old hymn gets a face lift from the Collingsworth Family. 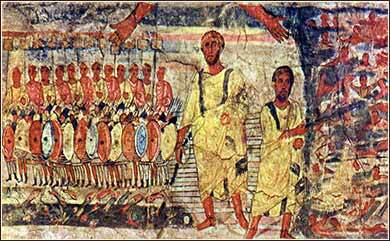 This fresco of the Hebrews crossing the Red Sea was found in the "Dura Europos" Synagogue in Syria. It probably dates between 150 AD and 256 AD. a staggering drunk is not much fun. cross them and they bite your head off. This very early psalm, also called The Song of the Sea, is probably the oldest (i.e., first composed) part of Exodus. Moses' sister, Miriam, taught it to the women of Israel and it would have been a well-known song already when Moses wrote the narrative. Jews reading the Book of Exodus for the first time would have enjoyed coming across it and learning how it came to be written — like hearing "She Loves You" in a film biography of the Beatles. The song, like many enduring songs, was written in a short period. It gave the Hebrews something to sing for the next forty years and would help to keep their spirits up during a time where despair loomed around every corner, by reminding them of their purpose and heartening them to their ordeal. Also, we must remember that people not yet born who would share this hardship; the song would serve to brand the history into the minds of those who had not lived it. And they needed heartening. The Israelites have now been tossed into a hostile and primitive world, both geographical and socio-political. They are utterly alone in a desert, a roaming band of marauders; and on either side of them are strong empires (Egyptians and Philistines) used to dealing with such bands. 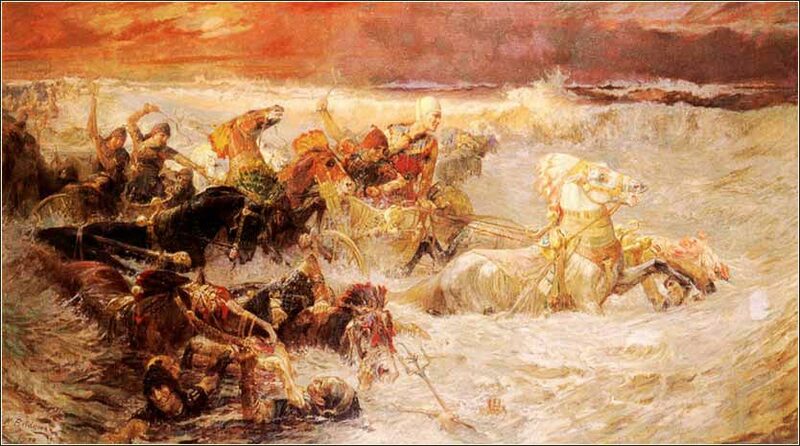 But, unlike most warlike nomads, they are thoroughly unprepared. These are not Tatars or Vikings or Goths. They are sedentary slaves and laborers, not foragers and soldiers accustomed to constant movement and combat. Yahweh is unmistakably their only hope; and so, this combination of creed, history, and worship is vital to their determination and morale. "The LORD" (original YHWH) "is my strength and my song." God being their "strength" meant more to them than to most of us; for it was every day apparent that, if they did not have God's hand, their own strength was so lacking that they faced quick annihilation. And He is their song; He is at the forefront of their mind and on their lips as they prepare to move forward.